"Oh no, Mom, don't throw that cornflakes cereal box in the trash! 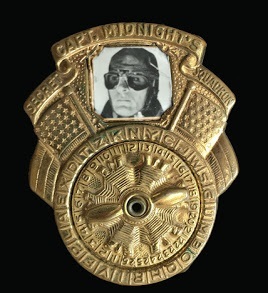 I need it to get my Captain Midnight secret decoder ring. With one book top and a dime I can send off for the ring, and by saving up, I've just enough allowance to get it." After carefully taping the dime to the box top, and after Mom addressed my envelope, I was off and running to the post office. "Be careful son, riding your new American Flyer bike on those busy streets, for the post office is on a very busy corner," my mom cried. "Oh, I will, Mom, not to worry," I shot back as I pedaled away. Arriving safety at the corner post office, and after carefully placing the nickel stamp in its place, I gently placed the envelope in the mail slot, giving its safe delivery a simple little send-off prayer. "I'm home, Mom," I declared as I rode back up our driveway. "That's nice son. Did you place the right stamp and did you thank the postman for his gracious help?' Mom asked. Days then turned into weeks, and weeks into months. Then it finally arrived, my long-awaited Captain Midnight decoder ring, all neatly wrapped in a confidential package. "Mom, oh Mom, this ring doesn't work," I mourned through my tears. And try as she might, Mom couldn't get the ring to work either. I was so disappointed. Now I guess Superman doesn't really fly as well. "Now, son, keep your chin up, O ye of little faith," (Matthew 8:26) consoled Mom. "What a time for Mom to quote a Scripture verse," I thought. When you expected each day to be fun. When people said "thank you" and "please"
When Moms called you in for supper at dusk. When you played hide-and seek and climbed trees. When downtown seemed so far away. When you caught lightning bugs in a jar. When drugstores had soda fountains. When schools had bike racks and most kids had bikes. When you had a wish for each star in the night. When no one had pedigreed dogs. When you read comic books by the ton. When you bought penny candy and five cent pop. When you drank chocolate milk from a glass bottle. When you watched TV through the store window. When you couldn't wait to see the new car models. When the only school problem was chewing gum. Now simply looking back, like all other young ones of the "oldest but best" generation, I had many life experiences growing up; some good, some not so good. As life turns out, they were also carried over into adulthood. Dad would oftentimes give his mini-sermon quote, "He can turn our stumbling blocks into stepping stones." You see, I'm so thankful for having such dedicated and God-fearing parents. As my life degenerated into adult difficulties normal to everyone, things always somehow seemed to turn out positive. looking back, growing up the most important message I remember was the strong, but simple, evangelistic teaching which states, "For by grace you have been saved through faith; and that not of yourselves, it is the gift of God; not of works, that no one should boast." (Ephesians 2:8-9) To that I shout "Amen." Additionally, in support of this evangelistic message was our old-fashioned church altar. Now, I realize the physical make-up of that old altar was no different than any other construction. However, that altar was very special for me, for that old altar was where I was first introduced to the Living God. Yes, we serve a just but loving heavenly Father. Come what may, through the tough times and the good, I am so thankful that through His divine sovereignty everything will all be fine in the end. Thus we must never give up, and be sure to be confident in what you do. There may be tough times, but the difficulties which we face by the help of God will make us more determined to achieve our faith-based (Hebrews 11:1,6) objectives and to win against all the earthly odds. Never Give Up, Face, Win, Tough, You. To this, I simply give a big Amen! So, I'll just sit back in my trusty Frazer Dad's green recliner chair, you know the one held together by tons of duct tape, and ask Alexi to turn to the fifties music channel. Then, as if by divine direction, I will simply and routinely fall into my faithful dream land of the past. And I hope I'll make that last winning basketball shot this time. "Oh Dad, is that you snoring down there again?" Times have really changed, and along with the changes we now have video games, PC laptops, iPhones, and the like. What has happened to the times when we kids would sit at the breakfast table with a cereal box in front of us while we munched away? We would read the box because there was always a really cool offer on the back and you just had to have Captain Marvel's Decoder Ring, if you could only save enough box tops. Better yet, maybe it was inside!! I don't know about you, but I'd dump the cereal out to find it, or reach in and fish around. My mother was never happy with me. Yes, we all have to have those status symbols, right? And wasn't it fun sending those coded messages to that new "puppy love" friend. There again, why don't kids hide their comic books behind their school books when studying in class anymore? Oh well, I guess times do change. And along with such change come many modern devices. Now the kids let their fingers do the walking, and talking, through all the keypads that is.